Once on the Rhine river, and then to Oberwesel for "Rhine in Flames!" On Saturday, September 14, 2019, it happens again! 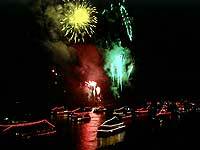 The "Town of Towers and Wines" will celebrate the boat and ship parade with a unique Rhine in Flames fireworks event with musical accompaniment. More than 50 charter boats await the numerous guests who will enjoy this nighttime fireworks spectacle from the advantage of the water. 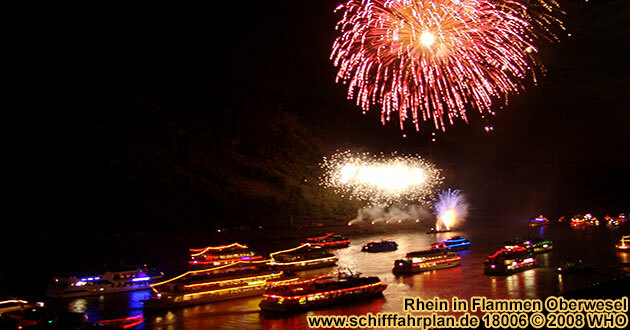 With musical accompaniment and the medieval town of Oberwesel as its backdrop, the fireworks display is the highlight of the cruise through the legendary region of the Lorelei rock. Be sure to reserve your round boat and ship parade ticket on time. Embarkation in Andernach (left Rhine river side) from 12:30 p.m., departure 1:00 p.m. Boat trip to Oberwesel, seat below deck, DJ music and dance. 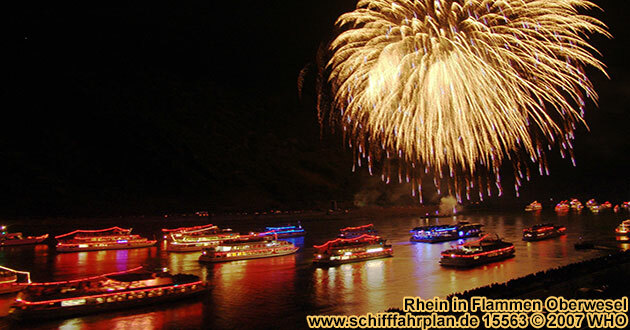 Return in Andernach about 12:30 a.m. Boat tickets together with buffet per person 91 EUR. Departure in Koblenz/Coblence (left Rhine river side) 3:45 p.m. Boat trip to Oberwesel, seat below deck, live music and dance. 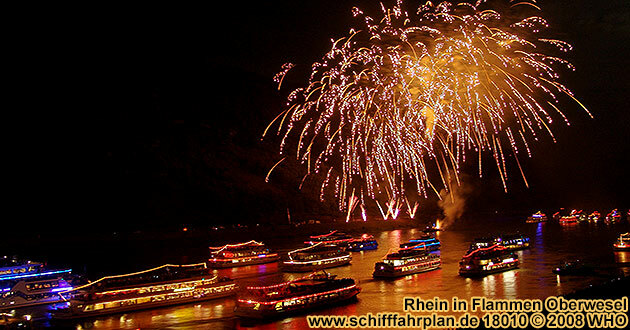 Return in Koblenz/Coblence about 11:30 p.m. Boat tickets together with buffet per person 91 EUR. Departure in Ober-Lahnstein (right Rhine river side) 4:35 p.m. Boat trip to Oberwesel, seat below deck, live music and dance. Return in Ober-Lahnstein about 11:10 p.m. Boat tickets together with buffet per person 91 EUR. Departure in Boppard (left Rhine river side) 6:15 p.m. Boat trip to Oberwesel, seat below deck, live music and dance. 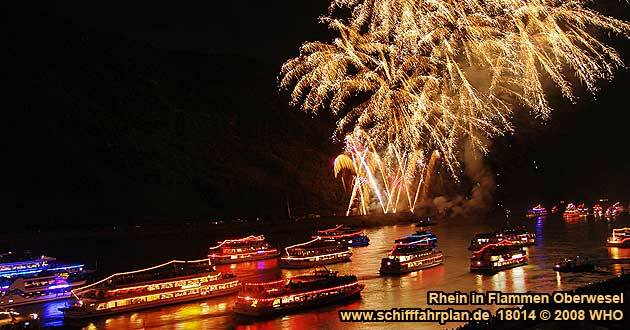 Return in Boppard about 10:30 p.m. Boat tickets together with buffet per person 91 EUR. Departure in Ober-Lahnstein (right Rhine river side) 4:35 p.m. Boat trip to Oberwesel, seat below deck, live music and dance. Return in Ober-Lahnstein about 11:10 p.m. Boat tickets together with 2-course menu per person 75 EUR. Departure in Boppard (left Rhine river side) 6:15 p.m. Boat trip to Oberwesel, seat below deck, live music and dance. 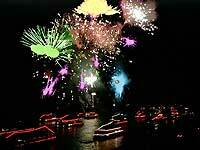 Return in Boppard about 10:30 p.m. Boat tickets together with 2-course menu per person 75 EUR. Embarkation in Koblenz/Coblence (left Rhine river side) from 4:45 p.m., departure 5:00 p.m. Boat trip to Oberwesel, seat below deck, live music and dance. Return in Koblenz/Coblence about 12:00 a.m. Boat tickets together with dinner per person 72 EUR. Departure in Braubach (right Rhine river side) 5:50 p.m. Boat trip to Oberwesel, seat below deck, live music and dance. Return in Braubach about 11:30 p.m. Boat tickets together with dinner per person 72 EUR. Departure in Boppard (left Rhine river side) 6:55 p.m. Boat trip to Oberwesel, seat below deck, live music and dance. 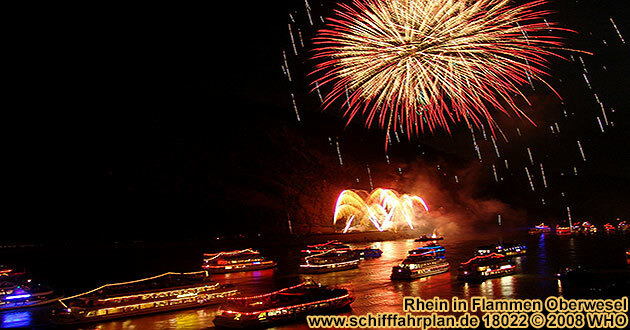 Return in Boppard about 11:00 p.m. Boat tickets together with dinner per person 72 EUR. Embarkation in Koblenz/Coblence (left Rhine river side) from 4:45 p.m., departure 5:00 p.m., round boat cruise on the Rhine river from Koblenz / Coblence to Oberwesel. Seating place below deck on a passenger boat, live music and dance on board. Return in Koblenz / Coblence about 11:30 p.m. Boat tickets together with dinner per person 68 EUR. Embarkation in Winkel (right Rhine river side) from 4:45 p.m., departure 5:00 p.m. Boat trip to Oberwesel, seat below deck, sole entertainer with live music, big firework. Return in Winkel about 1:00 a.m. Boat tickets together with 2-course menu per person 78,80 EUR. Departure in Rudesheim (right Rhine river side) 5:30 p.m. Boat trip to Oberwesel, seat below deck, sole entertainer with live music, big firework. 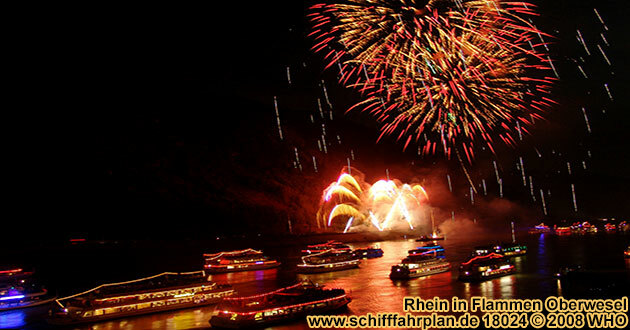 Return in Rudesheim about 12:20 a.m. Boat tickets together with 2-course menu per person 78,80 EUR. Departure in Bingen (left Rhine river side) 5:50 p.m. Boat trip to Oberwesel, seat below deck, sole entertainer with live music, big firework. 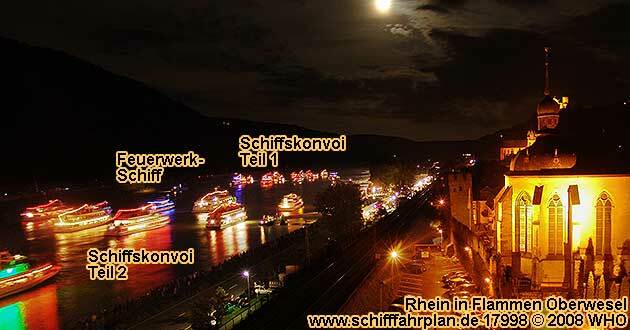 Return in Bingen about 12:10 a.m. Boat tickets together with 2-course menu per person 78,80 EUR. Departure in Bacharach (left Rhine river side) 6:40 p.m. Boat trip to Oberwesel, seat below deck, sole entertainer with live music, big firework. 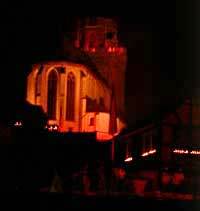 Return in Bacharach about 10:40 p.m. Boat tickets together with 2-course menu per person 78,80 EUR. Departure in Rudesheim on the Rhine River (right Rhine River side) 5:30 p.m. Boat trip to Oberwesel, seat below deck, big firework. 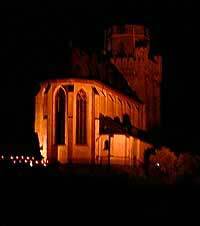 Return in Rudesheim about 12:00 a.m. Boat tickets together with dinner per person 71 EUR. Departure in Bingen on the Rhine River (left Rhine River side) 5:45 p.m. Boat trip to Oberwesel, seat below deck, big firework. Return in Bingen about 11:45 p.m. Boat tickets together with dinner per person 71 EUR. Embarkation in Assmannshausen on the Rhine River (right Rhine River side) from 6:05 p.m., departure 6:15 p.m. Boat trip to Oberwesel, seat below deck, big firework. 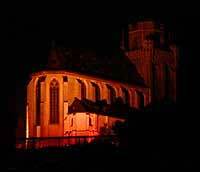 Return in Assmannshausen about 11:30 p.m. Boat tickets together with dinner per person 71 EUR. The scenic town Oberwesel on the Rhine river, known through the castle Schonburg, its town walls with its 16 medieval towers and its good wine, celebrates its wine market every year on the second weekend in September from Friday to Monday and on the following Saturday. Show center is the market place in front of the romantic scenery of beautiful half-timbered houses and the town hall as well as the town hall street. The wine market developed itself through a sales promotion event of the Oberwesel vine dressers, which had taken place every 14-days. In the years 1933 and 1934 a festival took place as precursor for the following wine markets, which have taken place every year since 1935. It has its fixed place in the Oberwesel event schedule and presents itself as touristic attraction and one of the prettiest vine dresser festivals on the middle Rhine river, between Koblenz / Coblence and Mainz. An absolute highlight is the firework spectacle "Rhine in flames" / "Rhine aflame - Night of the thousand fires" on the first Saturday. Numerous wine booths and vine dresser alcoves invite the visitors of the Oberwesel wine market to a drink in friendly atmosphere. Different kinds of wines of the Oberwesel vineyards. For your physical well-being is cared on all days, which are among the vine dresser alcoves. You can't miss the beginning of the wine market, because on all days they're opened through a gun salution. On all evenings, different kinds of bands play so that you may dance. Urban wind orchestras also provide musical entertainment with their promenade concerts. Different tradtional costume groups offer a colorful program with the performance of folkloristic and popular dances into the afternoon hours on both Saturdays and on the wine market on Sunday. One of the glittering lights of the Oberwesel wine market is the big parade on Sunday, which starts at the train station and goes to the north end of the town and back to the market place. 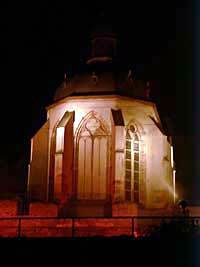 The conclusion takes place here after the greeting of the Oberwesel wine witch and the represenatives of the neighboring town to the guests. Just like the town of Winningen on the Moselle river Oberwesel on the Rhine river also has a wine witch. In the year 1948 she took part in the festival parade and is since then the main person in the parade. Oberwesel doesn't have a wine queen such as in the other wine towns in Germany. On the first wine market Saturday thousands of visitors gather together on the market place and the Rhine river banks in Oberwesel, in order to watch the almost half hour long pyrotechnical show of the event "Rhine river in flames - Night of the thousand fires" / "Rhine river aflame - Night of the thousand fires". A lot of people also watch the nightly fire magic from one of the approximately 50 passenger boats from the Rhine rivers. 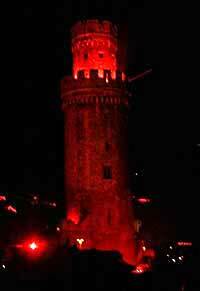 The "Rhine river in flames - Night of the thousand fires" / "Rhine river aflame - Night of the thousand fires" will be opened at about 9:00 p.m. with a greeting speech of the wine witch and the town mayor. 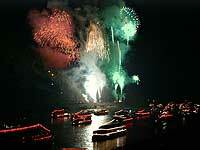 After a short welcome firework display Oberwesel shines its historical town picture. 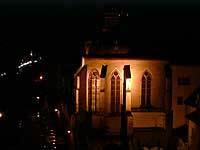 Among others, the partly still existing medieval town wall with its town towers, under them the Ochsenturm, the castle Schonburg above the town, both the churches Martinskirche and the famous Liebfrauenkirche, as well as the Wernerkapelle (chapel), which is built on the town wall, shines in bengal lights. Then a brilliant firework, accompanied by music, draws the night sky into a sea of lights. 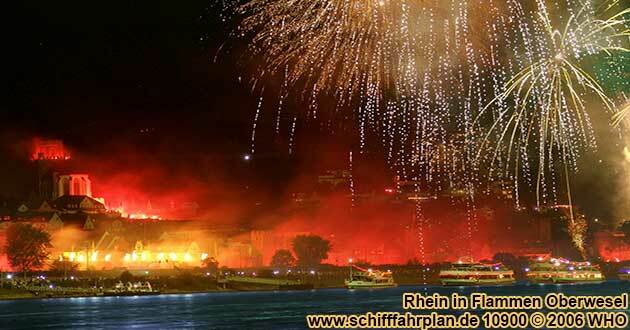 Exploding fireworks and fire cascades light up the Rhine river banks. The sounds of the fire spectacle echoes against the steep Rhine river hills which surround the Rhine river gorge. 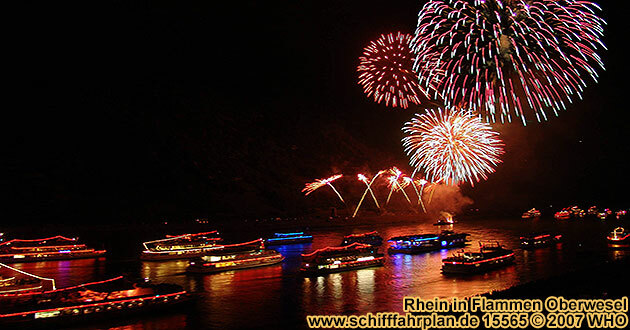 The main firework, which is subdivided into separate firework displays, will be shot off from the Rhine river hills and from the opposite side of the Oberwesel Rhine river bank. One can consider himself lucky, who has reserved a place on one of the boats and steamboats. The departure for the busses to Boppard is at the Busbahnhof (bus station) in Oberwesel at 5:30 p.m. From there the ancillary boats leave in direction of Oberwesel. During the boat cruise, the guests have the possibility of dinner after advanced booking. In St. Goar and St. Goarshausen near castle Rheinfels, castle Katz (cat) and the Lorelei rock, the boats form the boat cruise parade. At about 8:30 p.m. the Lorelei rock lights up in bengal lights. Gun salution and light crackling bombs can be heard. During this, the Lorelei rock song tunes in. 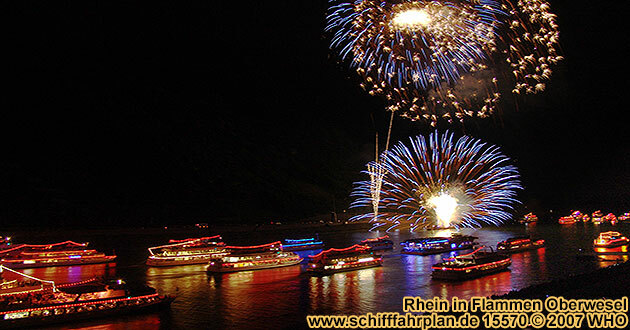 In this agreement, the passenger boats drive as a parade to Oberwesel to the "Rhine in flames - Night of the thousand fires", whose fascination no one can get away from. In the conclusion of this impressing spectacle, the boats return back to their starting point in Boppard. From there busses leave to drive back to Oberwesel at about 10:30 p.m., where they arrive about half an hour later. Jolly party atmosphere is celebrated during the wine market on the market place which lasts up into the early morning hours.